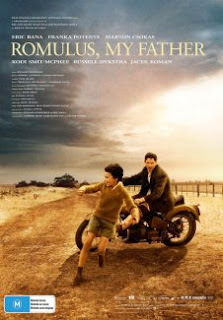 Shortly after young Rai (Kodi Smit-McPhee) begins noticing that women in his desolate town seem to be so struck by his exceedingly handsome father Romulus (Eric Bana) that they stare openly with smiles as bright as the Australian sun, a woman returns who had smiled at him decades earlier in World War II. With the arrival of his restless mother Christina (Franka Potente) who-- as Romulus phrases it-- seems to come and go as if their home is a hotel, young Raimond Gaita begins to become acquainted with the indescribably intense and complicated relationship shared by his passionate, quiet Romanian father and beguiling German mother who’s always had more than just a wandering smile for masculine passersby. Unable to be content in the hot desert with her husband and son, Christina has set up a second life in 1960 Melbourne, moving in with the brother of her husband’s best friend Hora (Marton Csokas). Instead of divorcing her for her frequent infidelities which we learn are nothing new, Romulus explains that he’s unable to turn his back on Christina whom he feels not only needs him but whose love affects him to such an extent that at times it’s driven him to suicidal actions. After such a stunt puts his father in the hospital once again, Rai starts getting bounced from one place to the next as he comes of age when staying with friends and family, all the while hoping that the catastrophic fire and gasoline relationship between his parents will somehow get resolved. Sumptuously photographed by Geoffrey Simpson (Oscar and Lucinda, Under the Tuscan Sun), the film marks the directorial debut of Richard Roxburgh who, after seven years of labor on his pet project, finally saw playwright Nick Drake’s adaptation of Raimond Gaita’s memoir realized on the big screen. Winner of four Australian Film Institute honors including Best Picture and three richly deserved acting accolades for Bana (in his finest performance since Munich), Csokas, and McPhee, Roxburgh’s work is not only a remarkable achievement but also provides greater proof of Bana’s range with a turn that, while shy on dialogue, manages to convey planets of emotion in a few chosen reactions. However, the film itself does frustrate viewers in its devastating second half, making us wish that greater detail had been transferred from Gaita’s book in reference to his parent’s courtship and background since we wonder just what had happened in the war to make them so mentally unstable. Despite this, it’s a lush, old-fashioned and impressive film that additionally benefits from extraordinarily magical touches of cinematic poetry such as the exquisite bookend of Romulus and Rai tending to bees that have fallen from a hive which echoes the healing bond of their relationship.